On our way to Equador the other day, an announcement came over the PA in our cabin. Very rarely do we get announcements in our cabin, so you know it had to be something going on. At first I thought perhaps we had crossed the equator and we were getting the 'official' announcement of our location. I was wrong. 'This is your Captain speaking, Captain Dimitris from the bridge....' We were told that off the side of the ship, just over a mile away, there was a small craft which was giving a signal that they may be in trouble. So as the announcement ended, the ship halted and started to manouver towards the boat. Looking out our wee port hole, you could see a small fishing boat which was bobbing in the waves with what appeared to be 3 men. One man was standing near the shelter on the boat with his arms extended over his head holding something about a meter long. We approached the boat, words were exchanged and the boat then appeared to be on it's way. It would seem that the folks in the boat, who were over 150 miles from shore were not in fact in distress, but rather folks who were looking to sell us some fish. Cost of the fish ~ $10. Cost to the vessel for turning around ~ $3,000. Can you imagine, would we really purchase just one fish to a cruise ship that holds 2200 passengers and 1000 crew??? Akis came into the cabin the other day to tell me about a friend of his who was wanted to go out and take pictures of the dolphins in Cabo. He was told that if he wanted to participate in the Dolphin swim it would be $165 to swim. It was a steep price, but definitely something very cool if we could do it. I figured I would check with the Shore Ex to see if I could get a better crew deal, and found out that in fact it was a VERY good deal 75% off! Due to some poor planning on my part, I had to head into town early to see if I could fed ex my keys overnight to Vancouver ~ many thanks to Al for agreeing to help out ~ and on my way back to the ship, stopped to book our outing. Yes, they did have time for us at 2pm. Akis and I headed back to shore on the tender only to find that our reservation was made for the day after, but they managed to 'squeeze' us into the 2pm slot. We sat in the lounge and waited our turn. It was an interesting location ~ lounge chairs, umbrellas, music and a bar. Had I known this was here, we could have come for drinks and just to hang out next to the big pool. There were 4 groups of 7 who were in the pool with 4 dolphins, ours was Renoir. He is apparently the Alpha male in the group and is 4 years old. 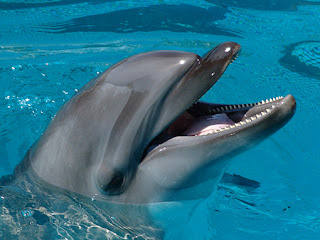 This is apparently very young as dolphins in captivity can live up to 40 years. As we got ready to get into the pool we watched as the dolphins swim in the pool. Here are some general shots of them. We were given the chance to touch, pet and even have the dolphin give us a kiss, a ride around the pool and other tricks. It was very cool. I opted for a belly ride, while Akis decided to have Renoit push him around the pool on his boogie board. Akis liked the ride so much, he decided to take 2 rounds ~ cheeky bugger. The one rule they had was 'no photos' ~ I can see why as we went to the photo gallery to see the snapshots they took of us in the pool. The rates were CRAZY. $17 for one printed photo! The catch being is that you have just done this really cool thing and want to have something to remember it by. Akis and I opted for the 8 photos on a CD ~ as we asked them about it once we approached the kiosk, we were told about their 'promotion' where for $20 more, we could have all photos that we were in along with the photos of the dolphins... We spent stupid money on the pictures, and it will likely be the most expensive CD I ever purchased, but sometimes you have to do what you have to do. This was our last Cabo, so I'm glad despite everything else that was going on, we managed to go and play with the dolphins.